Good Day Pharmacy is an independent-owned company that offers excellent pharmacy services to the facility partners and the patients. David Lamb founded the company in 1982 that initially offers consulting services to long-standing health care facilities. The company now offers their services through one specialty servicing and nine community based retail services for alternative care residents and long-term care. The company provides compounding medication. They even offer exclusive online services. Nancy Lamb, Vicki Einhellig and David are the co-owners of Good Day Pharmacy. The company has listed in "Colorado's Top 250 Companies" and "Colorado's Top 50 Family Owned Companies" by Colorado Biz. 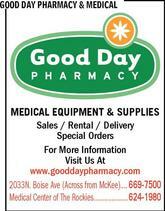 There are currently 0 consumer reviews about Good Day Pharmacy available. Share your review. Please take a note that you are about to post a public review about Good Day Pharmacy corporate office on CorporateOffice.com. This review will be public, so please do not post any of your personal information on this website. If you would like to contact the corporate offices of Good Day Pharmacy, please use their contact information such as their phone number, website, and address listed above to contact them. However, sometimes staff from Good Day Pharmacy headquarters do read the reviews on this website.